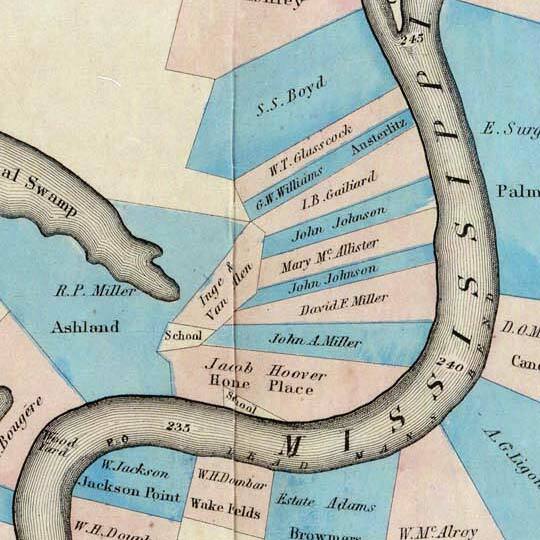 This map isn't part of any series, but we have other maps of Mississippi River that you might want to check out. This cadadstral map of the Mississippi Valley has France's thumbprints all over it, in terms of the land parcelage. On the French-settled Mississippi, I suppose it's no surprise that you'll note the distinctive French long lots, creating ribbon farms the entire length of their domain. Beautiful map; well-executed. One of my favorites. For more map resources and imagery from this period in Natchez's history, check out the Mississippi Historical Society's website.